Besides Calcium and Magnesium there are over 70 important elements present in seawater, which are essential for the health of corals.It is impractical to test all the small elements and bring them to the right level if needed. Luckily science is giving us a helping hand. We have formed 3 groups for the most important elements, for the leading element in the group we have a test kit. On the given value for this element you base your dosage on the value for this element. The typical beauty of your corals colours will only come to life when all trace elements are sufficiently available. Colombo has 3 additives for coloration and matching test kits in order to determine a precise dosage. Based on main element Iodine, also contains 2 other so-called ‘Halogens’ – Bromine and Fluorine. The elements in colour 1 are most important for pink colours. Based on main element Potassium, also contains Boron these elements are most important for red colours. Based on Iron, also contains many other metals such as Manganese, Cobalt, Nickel etc. All these metals are important for yellow and green colours. The splendid colours of corals will only reach their full potential when all required trace elements are available in the water. Colombo has 3 additives to maintain these elements, however you must use the three test kits for accurate dosing. With Colombo All in One you can add the elements such as Potassium, Iodine and metals, dosage is linked to the Calcium absorption. Most of the nutrients Corals get from algae, called zooxanthellae, which live in symbiosis with them. In most cases however, this is not sufficient for optimal coral growth. Other corals must absorb almost all their nutrition from the surrounding water. 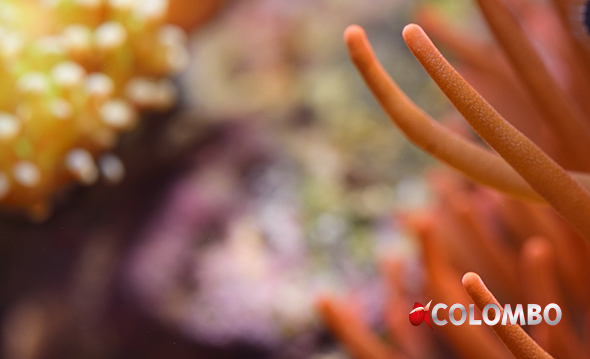 With Colombo Coral Vits you supply your corals with complementary nutrition. Additional nutrients such as vitamins and amino acids are included.